The snake-inspired looks for the Kobe 8 System by Nike Basketball continue with this all new upcoming "Pit Viper" edition. Already received by several ballers currently hooping in the Nike-sponsored Drew League, we see an interesting combination of pit viper-inspired snakeskin and mint accents taking over this new Kobe 8. Dark purple laces are also put in place to match the overall look and midsole, while a soft grey sole holds things down below. 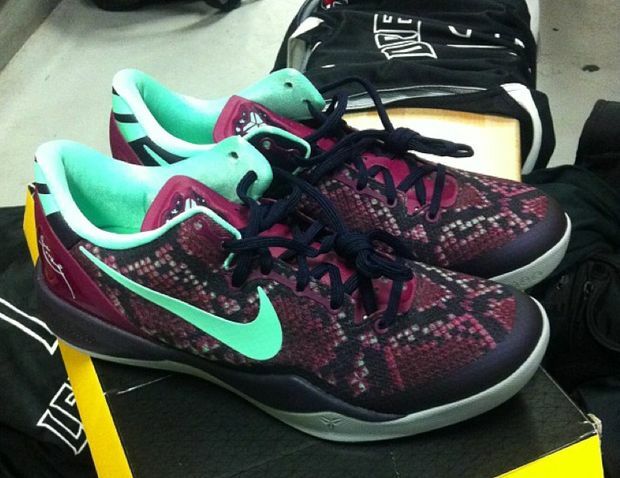 Stay tuned to Sole Collector for further details on the "Pit Viper" Nike Kobe 8 System.